SALISBURY will once again have its own city council in June after a break of 35 years - although it won’t be called City of New Sarum. Strangely it will face a dilemma which we in Warminster will understand very well - what to do with the Guildhall. Like Warminster Town Hall the Salisbury Guildhall was gifted to the city by members of the local aristocracy. In their case it was the Earl of Radnor from Longford Castle, in our case it was the Thynnes from Longleat. Just like Warminster the Salisbury Guildhall is about to lose its main tenants as the Magistrates’ Court will soon be moving to a purpose built court house opposite the Old Manor site. Salisbury District councillors, who also used to hold full meetings in the rather uncomfortable Oak Court will no longer exist. So the new city council has been given a fantastic asset which they need to find a role for. “I’m sure they will not allow the Guildhall to fall into disrepair,” said former county councillor Steve Dancey. “I have had to make many visits to the Guildhall over the years, some for serious and some for happy occasions. “I remember a number of mayor making receptions, which 20 years ago more often than not involved colourful independent councillors rather than the dreary minor ‘nth’ rate politicians we have today. 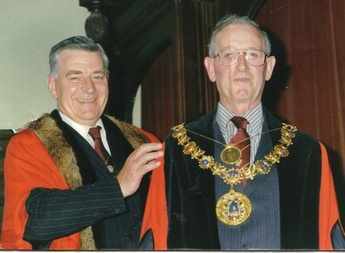 Pictured: Independent councillor Tom Cowie (left) and Bill McGrath at Salisbury mayor making- Bill was very modest but he was the only second man to make a successful home-run as a PoW escapee in the Second World War.